Civil society has so far reacted with cautious enthusiasm. While a number of NGOs consider the new policy a step in the right direction, they argue that disclosure of the involvement of outside actors in EU decision-making should be more more generous, including a retracable ‘legislative footprint’ of all lobbyists’ input at all stages of the process, and standardised disclosure rules that apply across the EU institutions. Timmermans, meanwhile has polished up the old inter-institutional ‘transparency competition’, inviting the other institutions to adopt similar measures. Following the resignation of Commissioner Dalli of Malta in 2012 under suspicious circumstances related to a pending tobacco directive, which have not yet been laid bare up until today, the powerful role of lobbyists in the EU’s policy process has received renewed public attention. On a par with lobbying Washington practices, those in Brussels however remain far less regulated. Until recently, Commissioners only disclosed their contacts with private interest representatives on a voluntary basis. 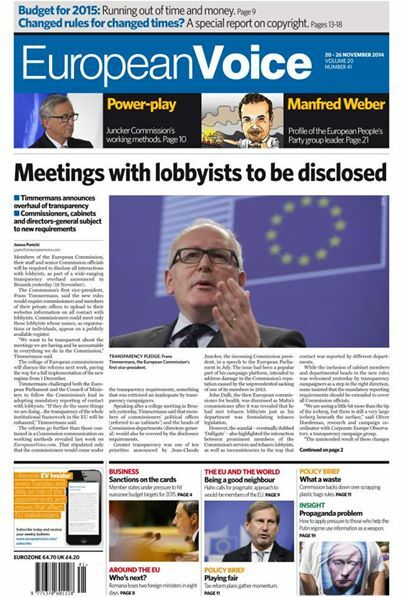 The same still holds for MEPs, a number of which now only meet with lobbyists included in the voluntary lobbying register, and member state ambassadors to the Council, who still operate fully out of public sight. This entry was posted on Monday, November 24th, 2014 at 12:17 pm	and is filed under Legal reform, Practice. You can follow any responses to this entry through the RSS 2.0 feed. Responses are currently closed, but you can trackback from your own site.